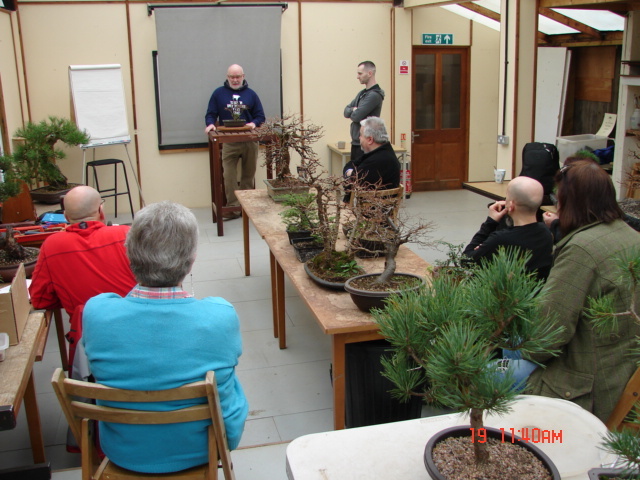 It was nice to see six ‘dyed in the wool’ Willowboggers gathered together for Willowbog Bonsia’s first regular monthly workshop of this new year. 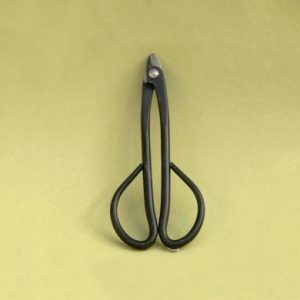 On the basis that ” if it ain’t broken don’t fix it ” nothing about the day has changed, we start with topical discussion, move on to a brief [ relatively speaking ! ] 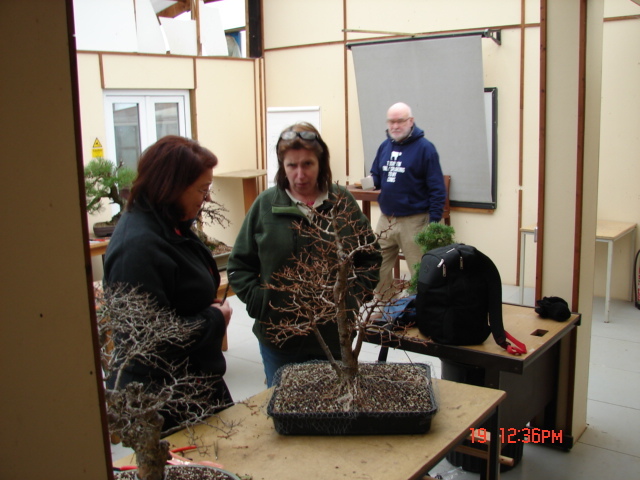 joint look at some of the trees brought along by the participants, before starting some practical work. 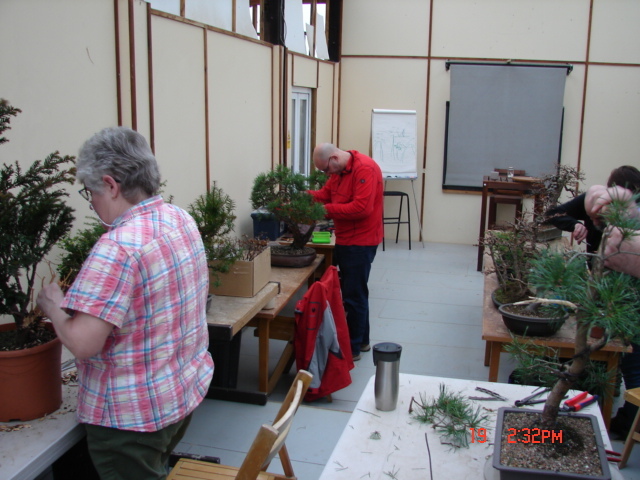 I have in the past looked to defend this format over the typical workshop of days gone by where the focus was entirely upon the practical work, but will not do so again except to point out that the majority of our participants hardly ever miss a month ! 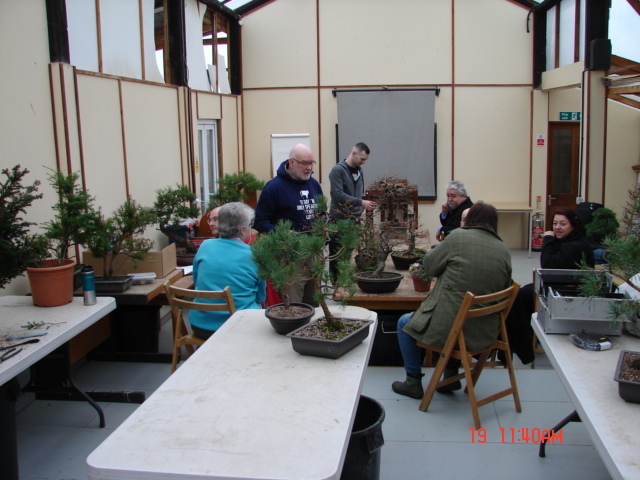 Of course, the fact that it is a reasonably priced bonsai day out, and that it is a chance to regularly meet other enthusiasts that have become friends and not least, at this time of year, Jean’s famous soup is part of the lunchtime offering! 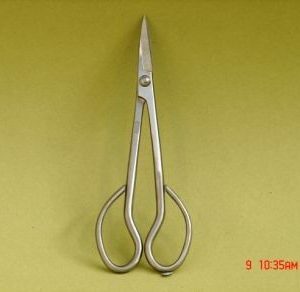 may also play their part. 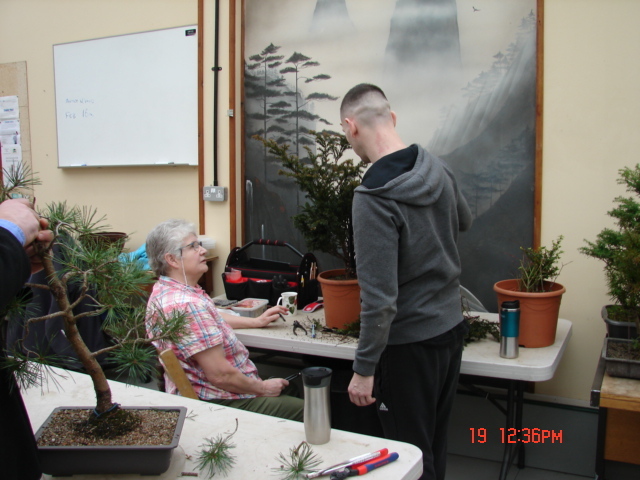 As almost always happens on these days I was grateful to have the valuable assistance of both Caz and Scott which is a way of assuring that almost whatever the numbers of participants, everyone gets a fair amount of time spent with themselves and their bonsai. 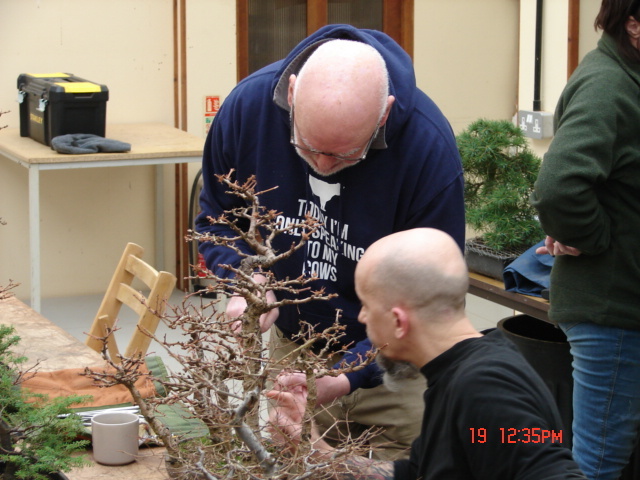 Me and regular Gary, two baldies together, looking at some of his Japanese larch. Scott helping self confessed complete novice [ aren’t we all ! ] 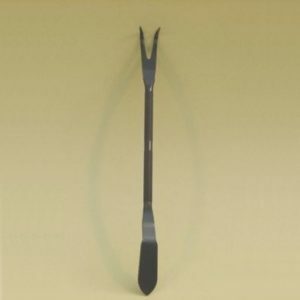 Norma, with a European yew raw bit of material. Caz spent a bit of the day guiding Angela as she attempts to develop a love of wiring, we are getting there Angela !! 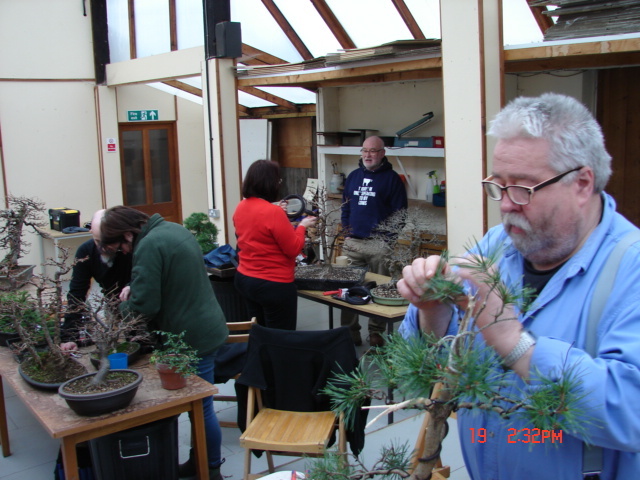 In the foreground Martyn also concentrates on wiring, this was on one of his Scots pines that are destined to become part of a group planting in 2020, bonsai often involves a bit of forward planning ! Willowbogger Antony in the red top, also working on a Scotty. Our sixth participant fails to appear on film as in each of the images he was behind the camera, although The G- man also worked on a Pinus sylvestris, thanks Peter for recording the day, also thanks to my helpers Caz and Scott and to all the partcipants, the new year is off and running, well at least ambling along ! 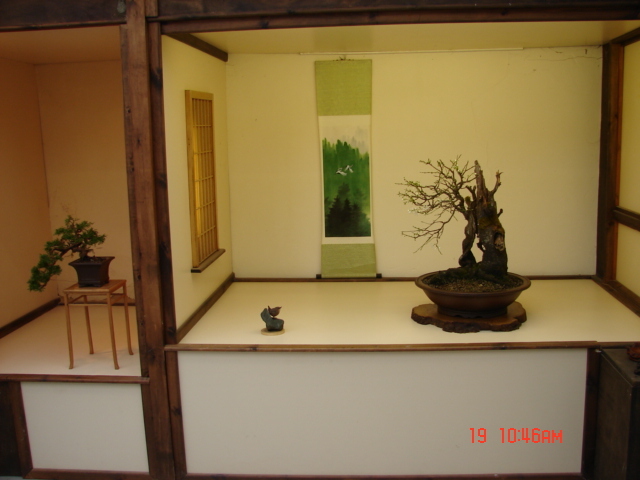 My choice for the studio tokonoma for this workshop day. 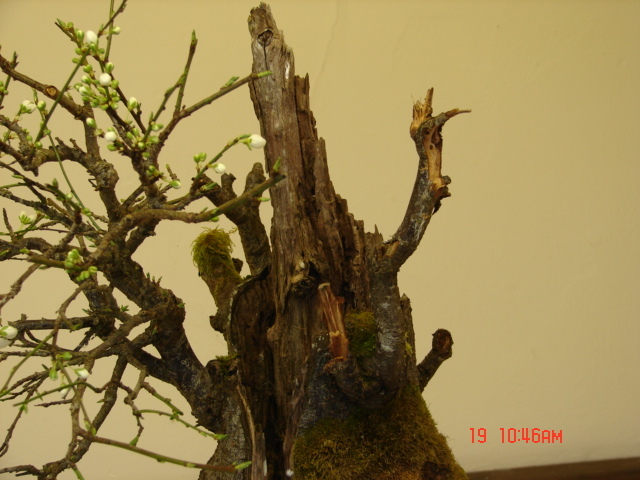 The Prunus of indeterminate variety from The Willowbog Collection was my main tree. 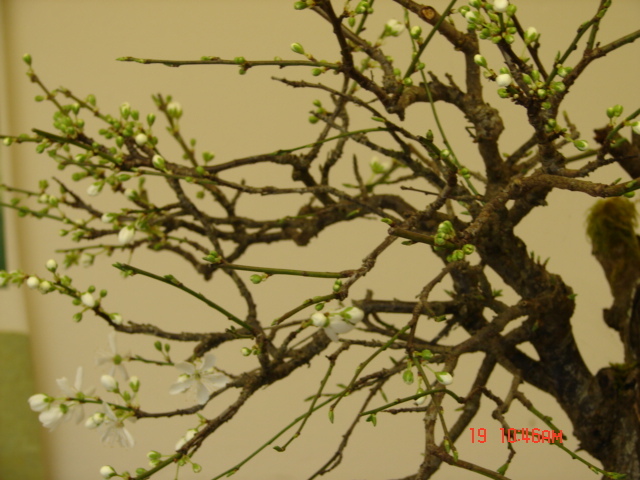 Chosen for the somewhat unseasonal appearance of blossom. 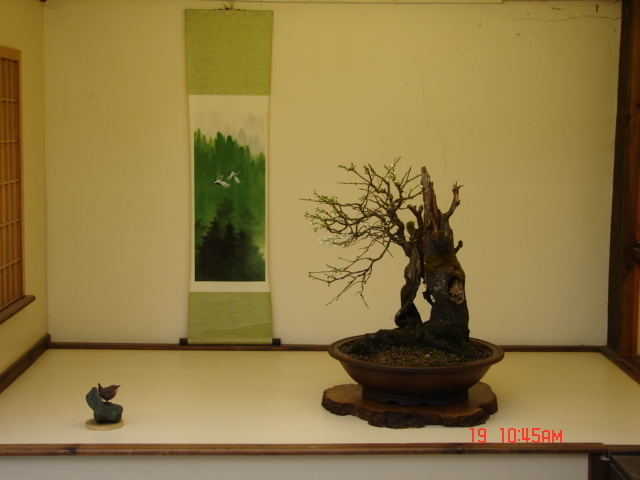 This bonsai somewhat inexplicably suffered a loss of approximately two thirds of it’s branch structure last year, sad but we can re-build something from the remaining. 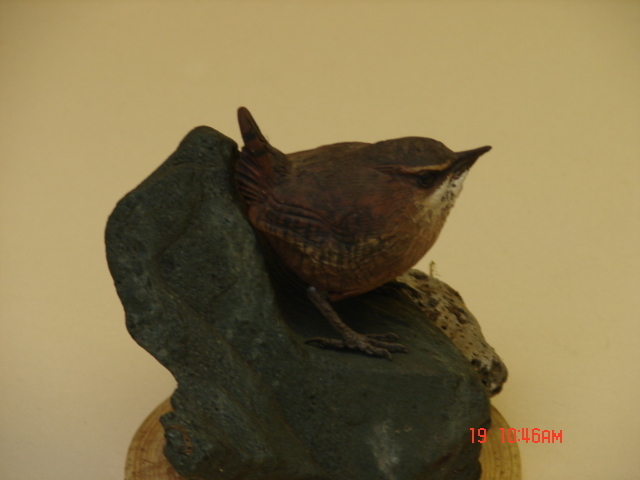 This alert little ceramic wren from The Proprietor’s ceramic collection paid court to the bonsai. 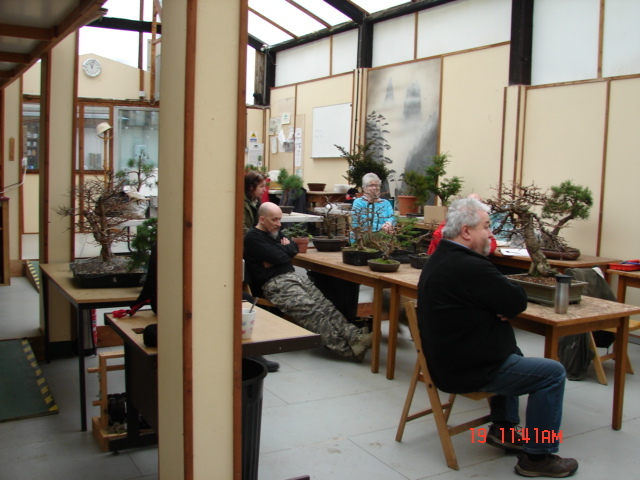 Next up our February Bonsai Chat on Saturday 2nd, why not come and join our bonsai community ?